It's day 4 of Smeared and Smudged Forum's 31 Days of Halloween Blog Hop! Okay, it's not so spooky but it is sparkly! And it's super easy to make, too! This was inspired by Tiffany Windsor's Felted Floral Headband from last week's show. Grab some felt and craft foam and get to makin'! Cut 4 different size circles of felt the largest of which will need to be 1/2' wider than the barrette base. Cut from the outer edge of each circle to toward the center ending 1/2" from the center. Cut points or rounded ends on each petal. Cut a strip of felt 3/4" x 2". Cut a craft foam bat using my print out. Using your finger, brush a very small amount of metallic paste to the tips of the flowers. Cut strips of the Fabric Fusion sheets to fit in the center of each flower circle, on the back of the bat, on the barrette base and felt strip. Stick all the layers together and stick the flower to the barrette base. Put the felt strip through the underside of the barrette and stick to the bottom of the flower. Add jewel eyes to the bat and you're ready to wear it! Now that is a fun and festive hair piece to wear. I would so wear that if I could. Thank you for posting. Yeah, I can't wear it either. Oh well! Cute! Love the bling! This can even be used for card or scrapbook embellishments :) Thanks for another awesome tutorial! Candace, I love your projects and your tutorials! I completely missed that this was a barrette even though it clearly said so. It is darling and if I had sufficient hair left I would definitely make one. As is, I'd have to put some sticky tape on the back to use it. Ok, Ike, here's the first bwahahahahaha I've used in October. I am honored! Thank you, Sharon! Thanks for sharing this idea, great project! I really like your batty barrette. Thanks for sharing the directions too! wonderful art..need one for my hair.. Very cute. My niece would love these. OMGOSH...I love this!! I love making Holiday barrettes for my nieces. 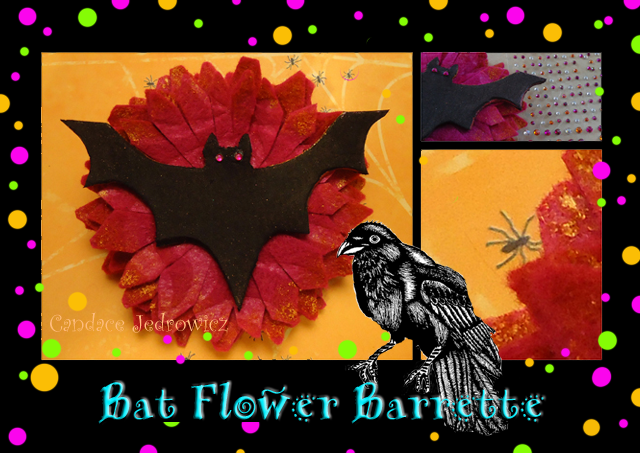 They will go "batty" over this one...hehe Thank you for always sharing and giving such great How-to directions. Thank you so much, Regi! Great idea and I know just the little lady who would wear it...LOL! Wow well anint that cool! Great idea! Absolutely Freakin' Awesome! I love it and you are the Queen of How To's! You Rock! Hugs! You are too much, Sara!